As one of the top garage floor epoxy companies in Des Moines Iowa, we’re excited to help you renovate your garage in a way that is sure to turn some heads. Garage epoxy coatings are gaining footing here in Iowa as they are popular among weekend warriors, mechanics, for their toughness, affordability, and stunning appearance. If you want something simple with the sole purpose of protection or something that will be sure to dazzle, we have a flooring solution for you. Just because garage epoxy flooring is among the best protection for your garages concrete doesn’t mean that it has to be pricey. Garage epoxy flooring is very competitive with traditional garage floor coatings which give you more bang for your buck. With our specially formulated garage floor epoxy coatings, your garage will be a seamless easy to clean surface with no joints for the dirt and grime to hide. Since there is no polishes or wax, all you will need is a soft bristle broom or a dust mop. Since our contractors have decades of combined experience, we can deliver your garage epoxy flooring in as little as one day. We are dedicated to a fast and easy approach for our clients. 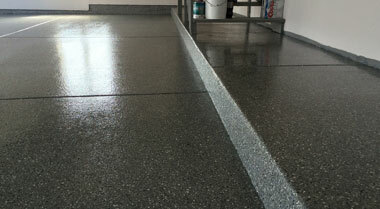 While epoxy looks great, It also protects your concrete slab. Garage floor epoxy creates a molecular bond with the concrete underneath to increase weight load, resist stains and damage to your concrete. When you look into an auto shop or even a garage with a garage floor epoxy coating, you will be sure to recognize how bright and new it looks. 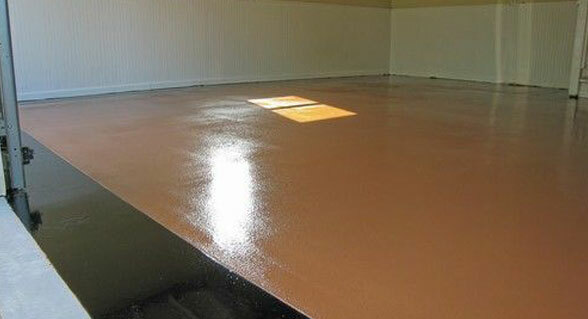 That is because garage floor epoxies are specially formulated to combat stains and wear and tear. 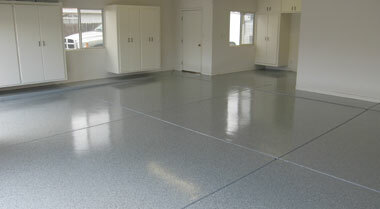 No other flooring can compete with all of the aspects that an epoxy garage floor coating. With durability, almost zero maintenance, and a truly stunning appearance, your garage floor is sure to be one of a kind. The overall durability of a garage floor epoxy coating is already enough to make the switch, but with an endless amount of designs and colors, it really sweetens the deal. Epoxy reigns supreme in the customization of traditional flooring with ample amounts of colors, designs and slip resistance. No matter what wild image you have created in your head you have, our garage floor epoxy contractors are able to make it a reality with color flakes and metallic pigments. Do you have any ideas already? Is it your dream to create a man cave or a bright and beautiful auto garage? 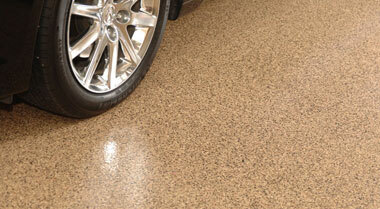 What about a head-turning metallic garage floor epoxy system that is sure to impress? 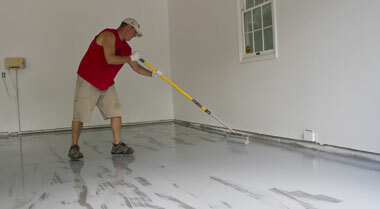 Our garage floor epoxy contractors here in Iowa will help you focus in on your dream garage. Here at epoxy Des Moines, Iowa, we believe that your garage floor should perform like flooring at a commercial facility, with the best of them. Want a pros opinion? Give us a call today! Most garages that we have all encountered are usually grim and under light areas. But with an epoxy garage coating not only will your garage flooring be hardworking and durable, but it will also significantly increase the brightness in your garage. Since garage floor epoxy is a super reflective surface, your garage will look up to 300 times brighter! With an epoxy garage floor coating, your garage will become a haven for working and your electricity bill as it will reduce the need for additional lighting. Thanks to this specially formulated product, you can give a kiss goodbye to losing objects in your garage, as epoxy flooring is a seamless and light reflective surface. Even though it seems like this wonder product will cost a fortune, you will be shocked to know that epoxy garage flooring is competitive with traditional garage floor coating systems. Since we are one of the top dealers in garage floor epoxy coatings here in Iowa, we are able to offer you the best rates from a professional installer. Our garage floor epoxy contractors only use the highest quality of garage floor epoxies giving you peace of mind. Depending on your needs or wants, the average pricing for an epoxy garage floor runs about 3$-12$ a square foot. Do not make the same mistake many DIY homeowners have made before and buy an at-home kit. Our contractors have decades of combined experience and will make sure your floor will work right the first time. Still having second thoughts about switching to an epoxy flooring system? Have a couple questions for us? Below are the most asked questions we receive from our clients. Be sure to contact us today if you have any questions that are more in depth! Will my garage floor be slippery? 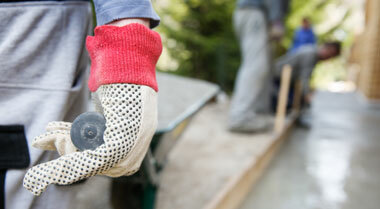 It is common belief that epoxy flooring systems are slippery, but that is not the case at all. The specially formulated product is designed to be a safe non-slip surface as long as it is dry and clean. If you know that your floor is going to be prone to water or any other form of moisture, we offer an additive to our epoxy to ensure the floor can grip even when wet. How long will my epoxy last? With proper cleaning procedures and maintenance, your flooring can last up to twenty years! But if your garage is more than an area to just park your vehicle, the average lifespan is approximately 2-3 years. The better you treat you garage epoxy coating, the longer it will last. How durable should an epoxy garage floor coating be? When your garage flooring is professionally installed there isn’t a thing that your floor won’t be able to withstand. With supreme water resistance, protection from even heavy impacts and resistance to staining, your garage floor will be pristine for 10 to 20 years! Epoxy Flooring Des Moines is a highly rated and professional epoxy flooring company located in Des Moines, IA, For decades we have been providing quality services to Des Moines and the surrounding areas so if you are looking for epoxy flooring, don’t hesitate to give us a call today! Epoxy Iowa | Copyrights © . All Rights Reserved. We are a third party referral company. All leads are referred to a licensed contractor in Des Moines, Iowa.